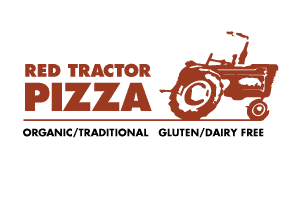 Welcome to the Red Tractor Pizza! Bozeman’s artisan, hand-tossed, brick-oven pizzeria with the freshest ingredients sourced as close-by as possible. We offer quick lunches and convenient dinner dine-in, pickup and delivery options. Now serving beer and wine, Red Tractor provides a casual, laid-back atmosphere for getting together with family and friends, new and old. For our traditional pizza crust, we use organic sprouted Montana grains, and we also offer delicious gluten and dairy-free options. Whether you want a quick lunch combo or a few pizzas for family dinner, the online ordering app makes it easy to order your favorites. Community-minded, Red Tractor Pizza also donates to a great cause every time you order. Be sure to select your favorite MSU club, BHS club or local nonprofit at checkout. Owner Adam Paccione brings years of New York style tradition to the wood-fired brick-oven at Red Tractor Pizza. His inspiration comes from the local farmers who supply him with his daily produce. It’s New York-style pizza with a Bozeman spin!